It is a beautiful damselfly which is widespread in Southeast Asia, occuring in countries like Laos, Thailand, Myanmar, Vietnam and Peninsula Malaysia. However, there has not been any records of it in Singapore. It inhabits clear, swift forest streams with lots of boulders. When perched, it looks like an unattractive dark damselfly. However, when its wings are opened, one will be amazed by the brilliant metallic colours on its wings. I took the following footage in Endau Rompin, Malaysia. Flashes of coloured light are visible on the four wings of the male insects when they fight, especially against a dark background. The last part of the video (00:50 onwards) shows a male landing, when the colours on the wings are more visible. Aristocypha fenestrella in Endau Rompin from tanghb on Vimeo. 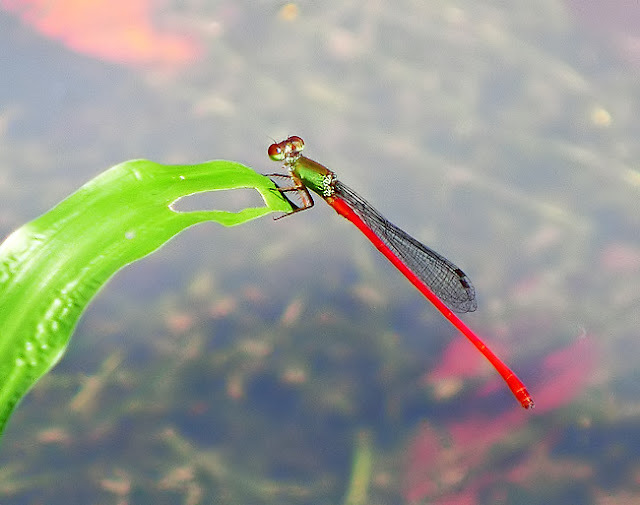 Ceriagrion chaoi is a rare damselfly in Singapore. Its fiery red abdomen always catches the eye of the observer. It used to occur in good numbers in the lotus pond in Bishan Park. It prefers the shaded parts of the pond where there are plenty of submerged vegetation. They were most active around 11 am, when it was easy to spot pairs of them in tandem (mating and ovipositing). 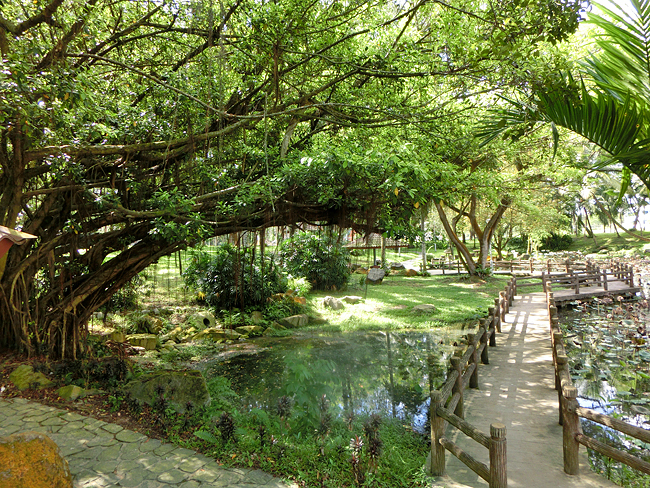 Bishan Park was closed from mid-2010 to March 2012 for a major redevelopment. Since the re-opening of the park in March 2012, I have been trying hard to look for them in the lotus pond but every time I was disappointed. On 21 July, at around 10:30am, I was delighted to see a single male in the pond. It was perching on grass in the shade of a big mature tree. The was the first C. chaoi individual in these two years. I could not find another C. chaoi in the pond. Ceriagrion chaoi, male, seen at lotus pond, Bishan Park on 21 July 2012. The big tree providing shade in the pond for Ceriagrion chaoi. Why has it become so difficult to spot C. chaoi in the lotus pond in Bishan park now? Apparently, the pond has not been modified by the Bishan Park redevelopment and the water quality, I believe, has not been affected by the project. 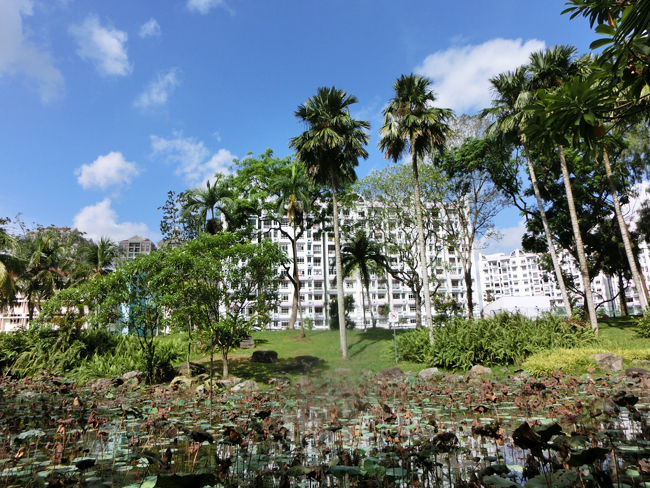 When I looked southwards from the lotus pond, Bishan Park Condominium was much more visible than before. I remember there used to be a row of trees blocking my view of the condomium buildings. Could the removal of those trees, although some 15m away from the pond, be responsible for the drop in C. chaoi population in the pond? I do not know the answer. Bishan Park Condominium more visible now.